I haven’t been blogging anything besides my DIY tutorials for a long time so I decided to post something that I recently bought. Not because I want to make a haul where I show you what I purchased, I rather wanted to show you something cute that I recently found! First of all, I FINALLY HAVE 2 STRAWBERRY GLASSES! 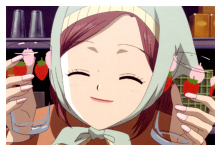 Because I am a Nana fan I always wanted those strawberry glasses. My best-friend (hello, Taka!!) sent me one glass that she made for me as a present but it is at my mom’s right now. =( And because these ones were SO cheap (1 Euro each!!!) I had to buy them… I know they don’t look like the real ones, but I still find them so cute and delicious! And I HAD to get this. First I thought it was a muffin… But it turned out it is an ice cream… If you open it, you can put something in it! And since I used like in in almost every video pink nail polish, I wanted to try another colour! What do you think about Violette? I hope everyone is fine and is enjoying the summer so far! Have a nice day and we shall speak soon! You have some adorable things here, I like everything!